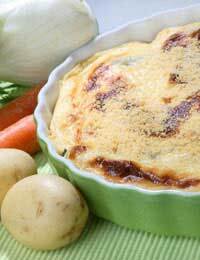 A simple meal with many variations, the potato cheese and onion pie is one of the first recipes practiced by youngsters when they first learn to cook. By ringing the changes this tasty recipe can become a favourite with your family. Use good quality potatoes for the mash. Varieties such as Maris Piper or King Edward are firm favourites. Always peel the potatoes removing any eyes and blemishes. Cut them into even sized pieces – quarters are fine for this recipe and rinse in salted water before placing in a pan with enough water to cover them and cooking gently until a knife or skewer can slide through them easily. Use a strong mature cheese so that the flavour comes through the onion and dominated the meal. A good mature cheddar is recommended although if using a low fat variety of cheese that can have less taste add a good pinch of mustard to the mix with the grated cheese. Use a grater with larger holes rather than fine as any larger lumps of cheese found in the mash when eating will add a rustic style to the recipe. Place the peeled potatoes and the onions into a deep saucepan and cover with boiling water. Bring to the boil and then simmer until the potatoes and onions are soft. Drain. Remove the onions and chop finely. Mash the potatoes thoroughly with the butter. Add a little milk if the mix is too dry. Add the chopped cooked onion and three quarters of the grated cheese. Stir thoroughly until the cheese and onion is distributed throughout the mashed potato. Place into an ovenproof dish and fork the top to give a rough surface. Sprinkle the remaining cheese over the top and then the sliced tomatoes. Place in the top of a hot oven or under a grill until the top is bubbling and brown. Serve immediately using oven gloves when you remove the dish from the heat as it will be very hot. Prepare as before but before covering with the cheese and tomato make four wells in the potato approximately two inches deep and four inches in diameter. Into each of these four wells add a raw egg. Cover with the cheese and tomato and place under the grill or in the oven. Again, cook until golden brown and you should find that the eggs have cooked through as well. Try this with some swet potato and pumpkin for a healthier option - lots around at the moment!